It's a bit ironic that one of the most successful band's of the 1970's - or even the entire latter half of the 20th century, would be branded as a "California" band that pioneered the term "Country Rock". It was strange because none of the original four members were from California. Drummer Don Henley hailed from Texas, Guitarist Glenn Frey was from Michigan, other Guitarist Bernie Leadon was from Florida, and Bassist Randy Meisner was originally all the way from the East Coast. Of course they all moved to California to pursue the dream of music, briefly hooked up as Linda Ronstandt's back up band, and then shortly after went on their own, and the rest is history. And what a history. This was really a bit of a complex band that accomplished an awful lot in a very short time. They only released six studio albums during their "heyday" and had quite a few personal changes considering, time-wise, they had such a short history. On their first album, they defined themselves beautifully as a well crafted, well diverse band, with different styles all over the place. Democracy was much more in fold in the early days - giving all four members basically an equal footing. Although over 90% of their hit songs would be sang by Henley and Frey, they started out with all members getting a fair share of the spotlight. Never a flashy band, it seemed like each one of the guys were playing a guitar on stage (even to some extent, Henley) with a bunch of backup musicians and writers. Their craft seemed to be their vocal harmonies and the fact that when they all united, a magic sound emerged that was unique, at least in the very early years, to this band alone. True, some of their music sounded "countryish" but not as much as you might think. The country tainted songs did seem to dominate the radio airwaves, however, and this first album is a perfect example. Two of the biggest songs Take it Easy and Peaceful Easy Feeling seem to fit the "country rock" label beautifully. As a matter of fact, you could argue that these two songs sounded almost a bit too similar to each other - but maybe the similarities would not have stood out quite so much had they not been big hits. Consider the other major hit on the album Witchy Woman - it's captivating, it's memorable, it's well loved, but there's nothing "country" about it at all. The same could be said for most of the other songs. Most of Us are Sad is a beautiful ballad that sadly is overlooked in their catalog. If anything, it shows off the softer side of the band, and more importantly, how strong their vocal harmonies could be. You probably also have to consider that in the early 1970's, this "sound" was much more in vogue, so maybe these guys weren't really the "pioneers" of anything - other than great music. There's so much more here that has been forgotten. The only other song with Henley at the lead, Nightingale is an unheard of classic as well. Lot's of twangy guitars, and heavy handed thick drum beats - so maybe this could also be a "country" song? Regardless, the whole album works. 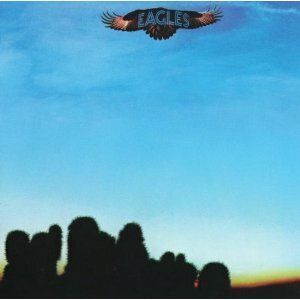 Every Eagle fan knows the Leadon led Train Leaves Here This Morning, and maybe since Bernie Leadon was the first "casualty" of the band is the reason why it's not recalled with as much fondness as a lot of their other early material. Again, it's the pleasant sound and the vocal harmonies that stand out the most. In fact, the only song here that doesn't really meet the high standards of the rest would be Earlybird, which sounds kinda hoaky and stupid with its bird chirping that lead off the song, yet it's so easily forgivable because, again, the harmonies are quite wonderful. So if you didn't "discover" this band until the Hotel California era, and all you know are the hit songs that saturated the radio throughout the decade of the seventies, this one would be a pleasant surprise considering the overall eclectic quality. This is one of their best, and even though they would put out several other masterpieces, it's a bit of a shame that they never tried to actually replicate the basic formula that worked so well here.